In Central and Eastern Europe, as in most other economies, the rubber and plastic products sector is small compared to other sectors of manufacturing, not reflecting its apparent importance in the modern world. However, it supplies a wide range of products (including tyres, plastic packaging, windows, plastic parts for cars, electrical engineering etc.) to all main branches of manufacturing. In the Central and Eastern European countries (CEECs), rubber and plastic products were somewhat neglected during the former communist regime, but developed quite well thereafter in the more advanced CEECs, where they also show favourable future prospects. 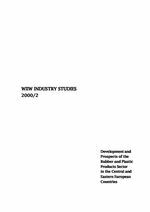 Part One of the study investigates the development and prospects of the rubber and plastic products sector in the following countries: Bulgaria, the Czech Republic, Hungary, Poland, Romania, Slovakia, Slovenia. In size, the rubber and plastic products sector plays only a minor role in total manufacturing today and contributes between 2% of manufacturing output in Romania and about 4% in the Czech Republic, Poland and Slovenia. As is typical for all CEECs and all sectors of manufacturing, wages, productivity and unit labour costs in the rubber and plastic products sector have generally been much lower than in West European countries, for which we used Austria as a point of reference. From 1993 to 1997, wages and productivity rose in all CEECs. As the wage increase was larger than the productivity increase, unit labour costs rose in all countries, except in Hungary. Nevertheless, the estimated unit labour costs remain at a much lower level than in Austria. On the EU market, in 1989, CEEC rubber and plastic products exports had a market share of about 3%, which increased steadily to 9% in 1998, slightly faster than that of overall exports (all shares without intra-EU trade). On the Austrian market, CEEC exports had a decisively larger share, accounting for 35% of Austria's non-EU rubber and plastic products imports in 1995, climbing to 38% in 1998. The development of the rubber and plastic products sector is strongly influenced by the development of the overall economy. The sector has performed best in Poland, Hungary and Slovenia, followed by the Czech and Slovak Republics, while it is trailing behind in Romania and Bulgaria. However, in general, the rubber and plastic products sector has very good future prospects throughout the region, as major segments of demand will experience vigorous growth. Some constraints might arise from environmental considerations, also with regard to EU accession. Part Two of the study presents a more thorough micro-analysis of the rubber and plastic products sector, containing company profiles of selected domestic enterprises and foreign investors in the two industries. Companies in the rubber and plastic products sector usually show above-average profitability and investment performance. Regarding the two sub-sectors, the rubber and plastics industries, the latter has generally a greater weight in the whole sector than the former. In Hungary, for example, the plastics industry produced 78% of the sector's output, while the rubber industry contributed only 22%. In Slovenia on the other hand, the respective shares were 54% and 46%, while in the Czech Republic and Poland they lay in between and measured about 68% and 32%. The company structure differs considerably, with small and medium-sized enterprises dominating in the former industry and large multinationals in the latter. In the CEECs, the tyre industry has especially attracted large foreign tyre companies, which have invested heavily in the region. In particular Continental from Germany, Goodyear from the USA, Michelin from France but also Bridgestone from Japan have formed joint ventures, acquired existing companies or built green-field plants in all countries, except in Bulgaria. The export performance of these foreign companies is especially high in the smaller CEECs, reaching 70% to 80% of the company's output. Export orientation is less pronounced in the plastics industry with its smaller companies. Producers in this field have partly evolved from former large chemical conglomerates and could also attract foreign direct investment due to promising future prospects.